As another crazy holiday season wraps up, Facebook Time Hop reminded me of a time a few years ago when the holidays were even a little bit more chaotic. But who doesn't love a twenty hour road trip to kick off the holiday celebrations? I've always considered the season not completely over until I'm utterly exhausted, red numbers in bank account broke, and crammed in the car with all the excessive trimmings and trappings. This picture was from our road trip in 2012. Those days we used to travel up the East Coast, stay a few days with Kim's family in Delaware, then spend Christmas Eve and day with my parents in Massachusetts. Even though those trips took up most of my vacation time for the year and we usually came home sick and tired, they were so much fun and I actually miss taking them. 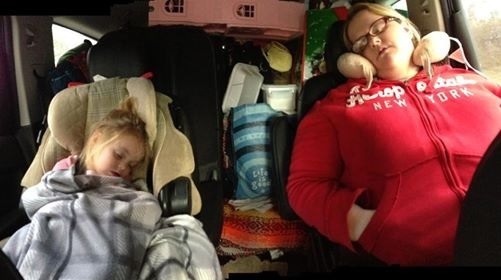 On the twenty hour drive back to Georgia, we would sometimes stop in Delaware again and pick up Aunt Katie and cousin Olivia. Adding a few more people to the Christmas load always meant the last twelve hours of the trip the car was stuffed to the max, giving new meaning to that old Grinch saying, "We rode with our load." During the every few hour body rotation, Aunt Katie got transferred to the tiny third row seat. Out of courtesy and politeness I asked, "Do you have enough space back there, Katie?" Her sarcastic reply, "Um, yeah... TONS" is still told with laughter at the Christmas dinner table. And isn't that what a family Christmas all about? In 2012 Senia Mae was two and a half years old. That particular trip, besides being sardined in the car for twelve hours, we experienced an employee brawl at a roadside Waffle House. The manager and the cook started throwing punches at each other right in front of the grill as we ducked under our booth in horror. At another pit stop one of the dogs escaped from the car and was rapidly heading towards the highway. All of the adults blanketed the parking lot and we eventually trapped our feisty canine. As we were pulling the reluctant dog back to the car, a certain toddler with a limited few-word vocabulary, realized that our plans involved returning to the crammed car. She locked her knees and halted right in the middle of the parking lot like a stubborn old mule. "Poopie Diaper, poopie Diaper," she pleaded. "Senia Mae, I know you don't have a poopie diaper because we just changed you in the rest room," I said. Her saucer shaped eyes had the most pitiful look as she peered up at me. "Poopie diaper?" she asked now, hoping she could at least get a few more moments of freedom. "We'll be home soon, ok?" I reassured her and we finally got back on the road. The little one completely understood why the dog tried to escape the confines of the overcrowded vehicle. It's been several years since we've made the Christmas trip up the East Coast and Santa now visits us at our home. Even though it is much more relaxing to not have to make the great drive, I am surprised that my fondest memories are not actually of the family celebrations, but the humorous two-day road trip that always ended up being the highlight of my holiday. The best part is not always the destination, but the journey. I told Kim this year that I actually wished we were making the trip again. Perry Como was so right in Home For The Holidays when he sang, "Take a bus, take a train, go and hop an aeroplane, put the wife an' kiddies in the family car! For the pleasure that you bring when you make that doorbell ring, no trip could be too far!"